Circumstellar disks of gas and dust play a crucial role in the formation of stars and planets. Until now, high-resolution images of such disks around young stars within the Orion Nebula obtained with the Hubble Space Telescope (HST) constituted the most direct proof of their existence. Now, another circumstellar disk has been detected around a star in the Lagoon Nebula - also known as Messier 8 (M8) , a giant complex of interstellar gas and dust with many young stars in the southern constellation of Sagittarius and four times more distant than the Orion Nebula. The observations were carried out by an international team of scientists led by Bringfried Stecklum (Thüringer Landessternwarte, Tautenburg, Germany)  who used telescopes located at the ESO La Silla observatory and also observations from the HST archive. These new results are paving the road towards exciting research programmes on star formation which will become possible with the ESO Very Large Telescope. The existence of circumstellar disks has been inferred from indirect measurements of young stellar objects, such as the spectral energy distribution, the analysis of the profiles of individual spectral lines and measurements of the polarisation of the emitted light . Impressive images of such disks in the Orion Nebula, known as proplyds (PROto-PLanetarY DiskS), have been obtained by the HST during the recent years. They have confirmed the interpretation of previous ground-based emission-line observations and mapping by radio telescopes. Moreover, they demonstrated that those disks which are located close to hot and massive stars are subject to heating caused by the intense radiation from these stars. Subsequently, the disks evaporate releasing neutral gas which streams off. During this process, shock fronts (regions with increased density) with tails of ionised gas result at a certain distance between the disk and the hot star. These objects appear on photos as tear-drop shaped, bright-rimmed areas with the cusps of the ionised regions aligned towards the exciting star. Such a region is also a very compact source of radio emission. Clearly, the harsh environment in which these disks reside does not favour planet formation. These findings were facilitated by the fact that, at a distance of 'only' 1500 lightyears (about 450 parsec), the Orion Nebula is the closest site of high-mass star formation. Furthermore, many circumstellar disks around stars in this nebula are seen in silhouette against a bright and uniform background and are therefore comparatively easy to detect. In principle, similar phenomena should occur in any giant molecular cloud that gives rise to the birth of massive stars. However, the detection of such disks in other clouds would be very difficult, first of all because of their much larger distance. The Lagoon Nebula (M8) is located four times further away than the Orion Nebula and it is also a site of recent high-mass star formation. Its brightest part constitutes a conspicuous region of ionised hydrogen gas (an 'HII-region') dubbed 'The Hourglass' because of the resemblance. The gas in this area is ionised by the action of the nearby, hot star Herschel 36 (Her 36). High-resolution radio maps show that the emission from the ionised gas peaks at 2.7 arcsec southeast of Her 36. An early explanation was that this emission is due to an unseen, massive star that is deeply embedded in the gas and dust and which is causing an ultra-compact HII-region (UCHR), catalogued as G5.97-1.17 according to its galactic coordinates. 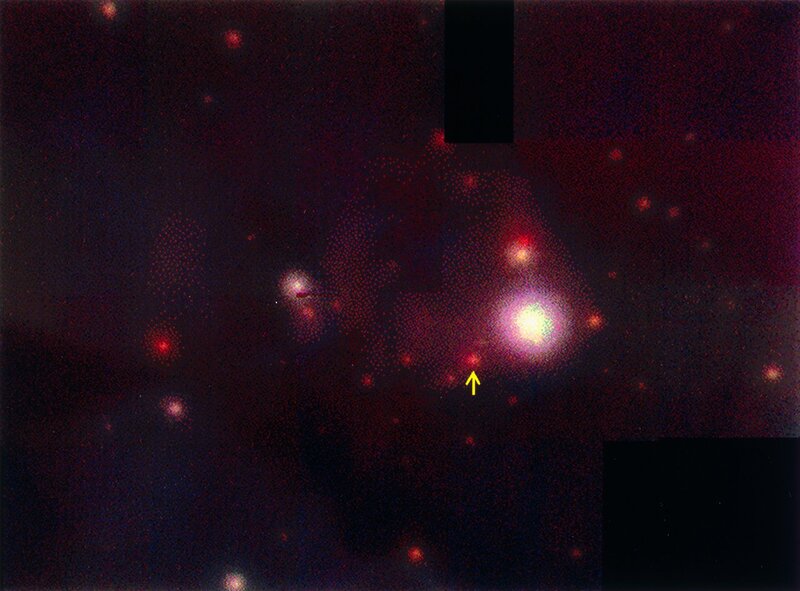 During a detailed investigation of such ultra-compact HII regions, Bringfried Stecklum and his colleagues found that, unlike ordinary UCHRs, this particular object is visible on optical images obtained with the HST Wide-Field Planetary Camera (HST-WFPC). This means that, contrary to the others, it is not deeply embedded in the nebula - its light reaches us directly without suffering a high degree of absorption. They subsequently obtained a series of high-resolution, near-infrared images using the adaptive optics camera ADONIS at the ESO 3.6-m telescope and the speckle camera SHARP at the 3.5-m New Technology Telescope, both at the La Silla observatory. These observing techniques revealed a star which is slightly offset from the extended optical image of G5.97-1.17 seen on the HST-WFPC frames . This star is found to radiate strongly in the near-infrared spectral region, quite similar to the reddest central stars of the Orion proplyds . This is a clear sign of the presence of circumstellar dust. In addition, the star is intrinsically not as bright as Her 36; it is therefore less massive and exercises less influence on its immediate surroundings. Thus, it cannot be responsible for the observed ionisation of G5.97-1.17. The recent release by the Space Telescope--European Coordinating Facility (ST-ECF)  of new HST images taken during a second series of observations of M8 with the new HST-WFPC2 camera allows an unambiguous identification of the physical nature of G5.97-1.17. On these images, G5.97-1.17 is spatially resolved and presents the typical bow shape with the apex of the bow pointing towards Her 36. 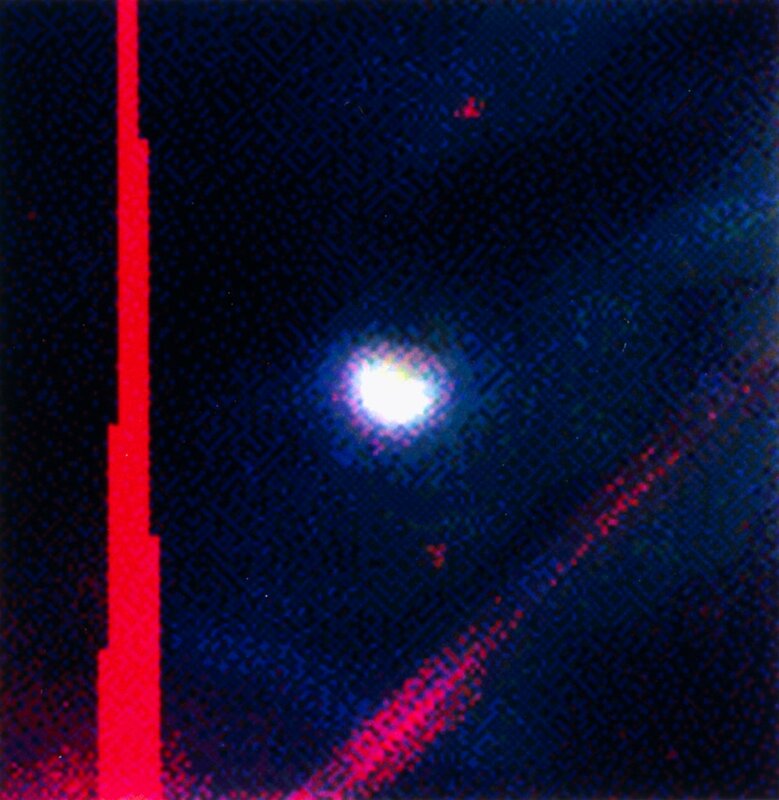 The infrared star, seen on the ESO images and barely visible on the HST-WFPC2 images taken at far-red optical wavelengths, is indeed situated behind the bright bow which is most conspicuous in the light of the red H-alpha spectral line, emitted by hydrogen atoms. The appearance of this object is thus similar to that of the proplyd sources found in the Orion Nebula. This is quite obvious from ESO Press Photo eso9708 which shows a colour composite based on HST-WFPC2 images obtained through narrow-band optical filtres, isolating the light of doubly ionized oxygen atoms ([OIII]; blue) and atomic hydrogen (H-alpha; green) and in a far-red band (red). 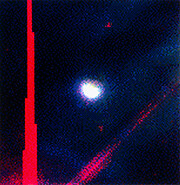 Two more faint stars are seen in this image while the bright star Her 36 is outside the border of the image (its location is at the lower left, at the intersection of the vertical, saturated CCD column and the 45 o line caused by the light diffracted in the telescope). In contrast to the Orion Nebula, the non-uniform distribution of light-absorbing dust in the foreground makes the detection of the ionised tail difficult. Note that the image is rotated clockwise by 146 o with respect to the astronomical coordinate system. The detailed description of these results is the subject of a forthcoming research paper . The new understanding of G5.97-1.17, i.e. as harbouring an evaporating circumstellar disk heated by far-ultraviolet radiation from Her 36, is supported by the fact that a sufficient amount of high-energy ultraviolet light is received from that star to account for the radio emission observed from the ionised bow. This object therefore represents the first proplyd-type object detected outside Orion at a much larger distance . The full description of this phenomenon requires detailed knowledge on the physical conditions of the star Her 36 and the object itself. Unfortunately, sofar little is known about the properties of the stellar wind from Her 36, the mass-loss rate from G5.97-1.17 and the velocities of the interacting matter. The astronomer team therefore intends to carry out further adaptive-optics imaging and spectroscopy with the ESO instruments later this year. The detection of this new object shows that direct proofs for the existence of circumstellar disks in distant star-forming regions are possible with currently available telescopes. It also represents an important step forward for the preparation of scientific programmes devoted to the formation of stars and planets that will soon be carried out with the ESO Very Large Telescope (VLT). The new results demonstrate that the high-resolution images that will be obtained with the future giant telescopes and, especially, with the VLT Interferometer (VLTI) will most likely lead to important breakthroughs in our understanding on the complicated processes of star formation. This will in turn cast new light on how the Sun and the Earth came into existence, more than 4.5 billion years ago. The team consists of Bringfried Stecklum and Steffen Richter (Thüringer Landessternwarte, Tautenburg, Germany), Thomas Henning, Ralf Launhardt and Markus Feldt (Astrophysikalisches Institut und Universitätssternwarte, Friedrich-Schiller-Universität Jena), Thomas L. Hayward (Center for Radiophysics & Space Research, Cornell University, New York, USA), Melvin G. Hoare (Physics & Astronomy Department, Leeds University, UK) and Peter Hofner (National Astronomy & Ionosphere Center, Arecibo, USA). Some years ago, infrared observations with the IRAS spacecraft led to the discovery of a disk around the isolated, nearby southern star Beta Pictoris . This result was published in a paper by Stecklum et al. in 1995 (ApJ 445, L153). The ST-ECF is a joint ESA/ESO group of specialists that is located at the ESO Headquarters in Garching, Germany. Submitted to the Astronomical Journal . More details on the investigation of star formation in M8 and the newly discovered proplyd can be found on the World-Wide Web page of the Thüringer Landessternwarte.